I'm a very technical person, even with painting. 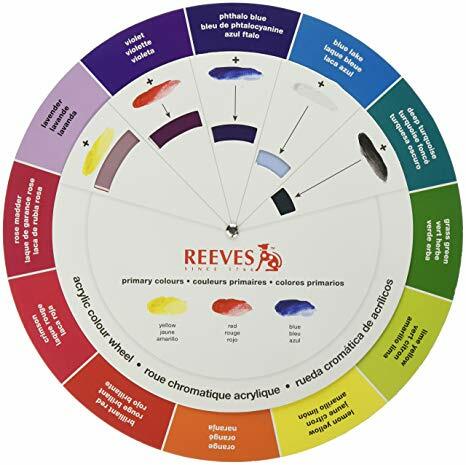 I wanted to set up my palette like a graph so that it does not become messy, no matter what color I want to mix. This is not an issue if I was only concerned with hue and value (e.g. hue is the X axis and value the Y). However, intensity would seem to require a third axis. Are there any established methods for laying out the three "axes" of color on a 2D palette? What you want to achieve is impossible on a 2D surface and probably wouldn't help you much. What you describe is pretty much the YUV color sheme. 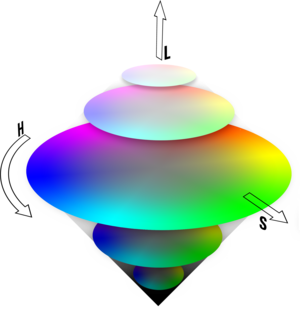 It's usually represented as a 3D cone or cylinder, with the purest colors (Hue) spread around the perimeter, medium grey (the least Saturated color) at the center and black & white (the colors of most and least Luminance) at the highest and lowest point, respectively. The number of variables. If you insist on having 3 variables (hue, saturation, luminance) you can only represent them on 3 axes. Real paint doesn't mix like that. The color cone suggests that mixing opposite colors yields grey, which is wrong. You could argue that mixing opposite colors yields the one right between them on the perimeter, but that's wrong, too. On a computer screen, mixing yellow and blue yields green. In reality, you get a muddy, ugly brown. Then lay your colors on the palette according to the hues you want to mix and the effects you want to create in your painting. You could mix your fully saturated base hues on one axis, run the desaturated mixes at a right angle to those and if there is room go off on a diagonal with tints of the colors you are using. 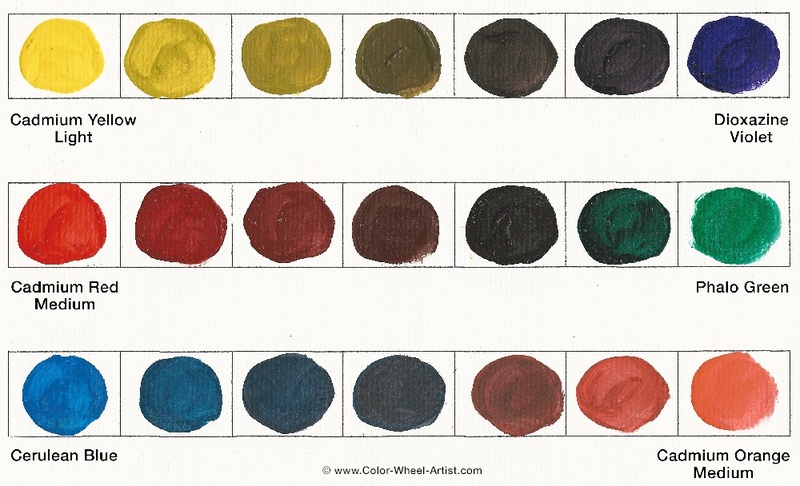 Alternately just use a different area of the pallet for tints or saturations depending on your preference. Other than starting with a cool and warm version of the primary colors I have never heard of a standardized pallet or one that seeks to capture the entire available spectrum. Each artist I know has their own layout and each painting calls for different colors. I think you would be wasting paint and time trying to create a pallet like the color picker from Photoshop, and even in digital painting applications there are multiple areas for choosing by hue, tone or saturation. You just need to find what works for your style through experimentation. The simplest answer I can think of is two use two palletes, or divide your pallette into two sections, and use them for seperate things. For example, you could have one pallete that is for the hue and saturation and then have white and black on the separate pallete. When you get the desired hue and saturation you move it to the white pallet and mix the value. You could organize these in circles or lines, it doesn't matter, what matters is organizing it in a way that makes sense and works for you. A very helpful tool for this is a numbered grey scale, in addition to the color wheel. Many illustrators begin each piece in greyscale, to make sure the image reads properly, and then match the value of the colors they mix to the value of the greyscale drawing accordingly. It's a great way to break down your coloring process and achieve consistency. Which is why I would recommend using your second pallets just for value. Not the answer you're looking for? Browse other questions tagged painting color color-theory or ask your own question. Is there any way to print white colour onto paper? How can I know what chemicals are there in a 'hue', for example viridian hue?